Newsok.com is Oklahoma’s leading local website with over 1.8 million monthly unique visitors and 15 million page impressions. 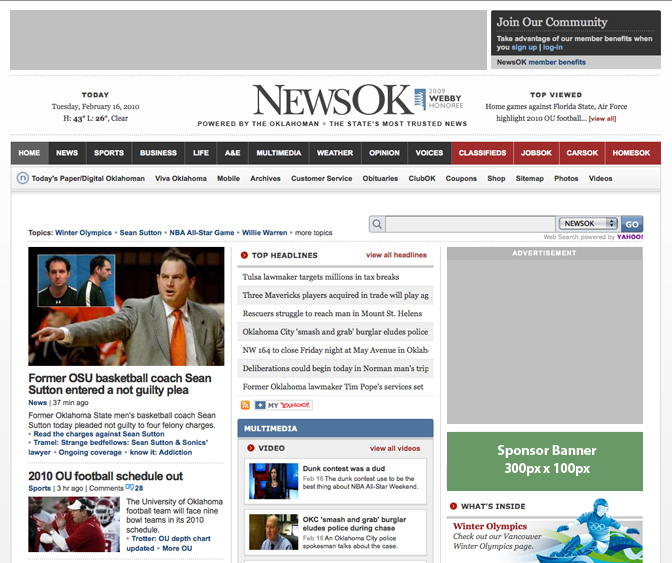 NewsOK has the most innovative and in-depth news, sports, and entertainment coverage in the state. NewsOK was even nominated for a Webby Award, earning bragging rights as one of the top 12 newspaper websites in the world. 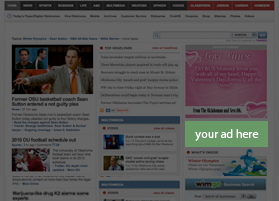 Get the most out of your advertising budget on the state’s most highly-visible site. Deliver your message to the right audience at the right time. NewsOK.com – NewsOK is the #1 media source in the workplace. Reach highly-educated consumers with above-average incomes. 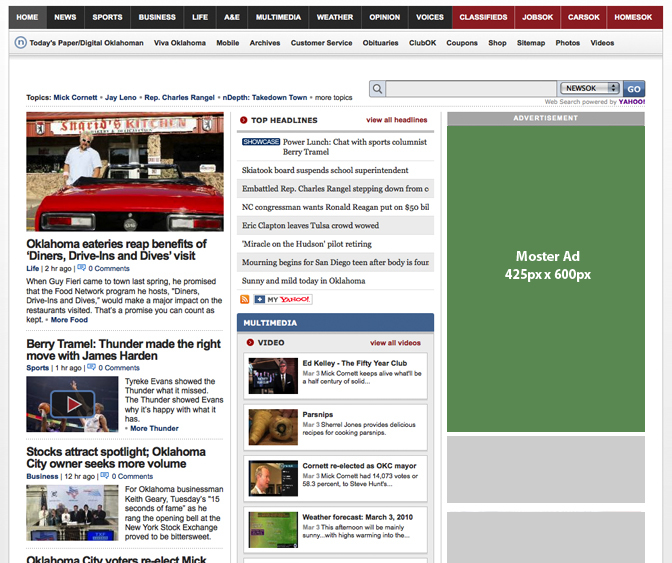 Video – NewsOK places more video online than any local TV site. NewsOK’s video coverage earned the site a finalist spot for the AP’s Innovator of the Year award. 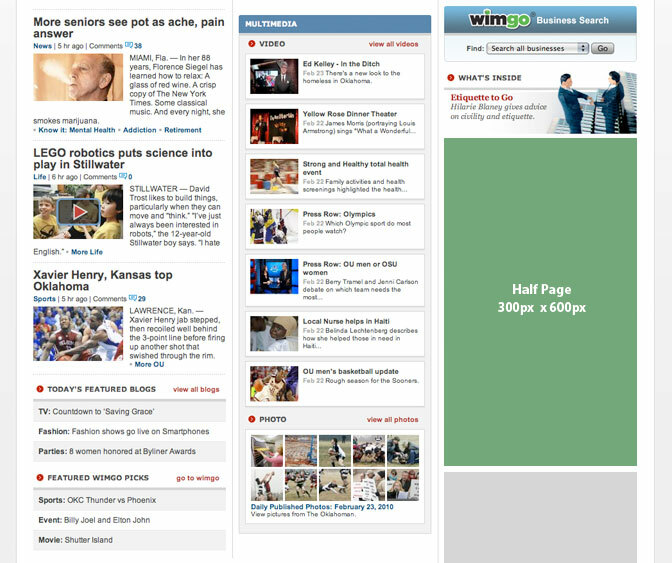 wimgo.com – Oklahoma’s comprehensive events calendar and entertainment site is now also the state’s largest business directory. Search Engine Marketing – Deliver your message to customers who are specifically searching for the products and services you offer. Reach customers on the four largest search engines. Yahoo! 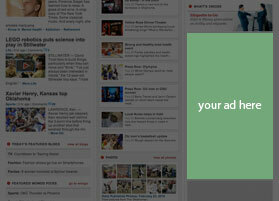 – Industry-leading technology lets you reach specific audiences, such as female shoe shoppers, on NewsOK and Yahoo! Mobile – Exclusive iPhone apps and smartphone sites reach active, upper-income Oklahomans. Text Alerts – Tie your brand to text messages about sports, weather, news, or traffic. Mobile Club – Increase loyalty by offering your customers the option to receive special offers from you via text. Email blasts - Increase sales by sending your offer directly to potential customers. Get the best return from your advertising budget. 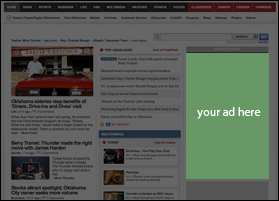 Click here to learn how advertising with NewsOK can take your business to the next level.